We invited two new guests from physics for our usual Friday cooking. One of them is from Poland and he never cooks in his apartment since his arrival in Montreal. It is a great opportunity to teach him a thing or two for quick and simple dishes. The other one is from France, he is just curious about what we usually do on Friday. 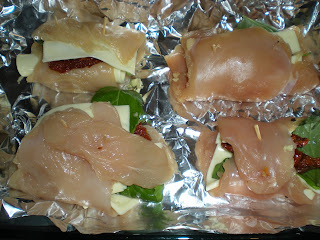 To impress the new guests, I made chicken rolls stuffed with cheese, sun-dried tomatoes in oil and basil. 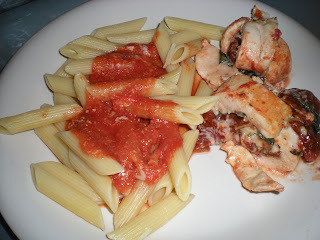 These are cooked in tomato sauce with white wine reduced. This recipe can found in the Kitchen Bible cookbook. Some of my favorite cookbooks are listed at the bottom of this blog. 2. Lightly pound each chicken breast between 2 sheets of plastic wrap until the breast is 1/4in. thick. 3. Place chicken beasts smooth sides down, on work surface. Season with salt and pepper. 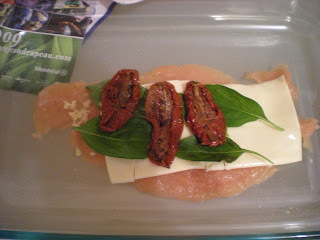 Arrange 2 slices of swiss cheese, 4 basil leaves and 3 sun-dried tomatoes over each piece of chicken. 4. Roll up the chicken and secure with wooden toothpicks. 5. Line the aluminium foil on a 13'' by 9'' baking pan. Lightly oil the foil and then place the breasts. Brush with oil. 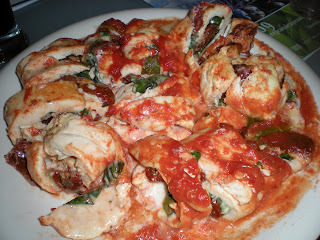 Pour wine and crushed tomatoes around the breasts. 6. Cook in the oven until the chicken is opaque, about 25 minutes. 7. Meanwhile, cook pasta as instructed. 8. Transfer the chicken to carving board. Let it stand for a few mins. Remove toothpicks and cut crosswise. 9. Arrange slices on individual plates. Add pasta and spoon the sauce on top.